-Less stiffness to overall limbs of ragdolls by increasing their bend and twist radius. -Increased friction. Ragdolls had almost no friction which resulted in ice-like sliding. -Updated humanoid ragdolls to match changes made in patch 1.8. Pick only one of the main plugin files in the plugins folder to install. Inside that same folder extract the actor folder to the same location above. Your FPS needs to be capped at 60. The game's physics is not designed to handle FPS above 60. Q: More force for magic and less for arrows? Magic and arrows share the same force value so I can't make one have more force than the other. It's a vanilla bug with that spell. 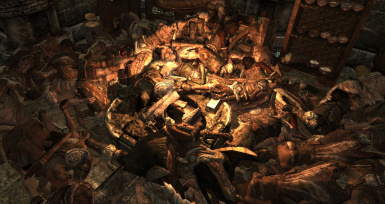 use this Mod: *pending* no mod that fixes this yet for Skyrim SE. Q: Ragdoll arms do not rise above their shoulders. There will be some bad deforming of the shoulders if I allowed this. It depends on what part of the body you grab usually the upper torso is where it's easy to lift bodies. If you don't use the plugin file you may not be able to left bodies. 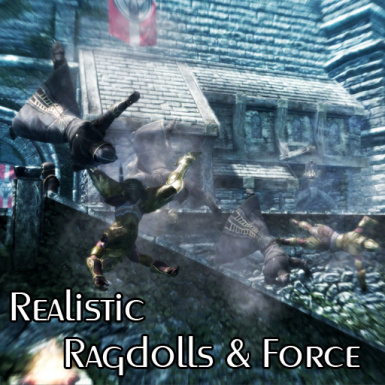 The friction of the ragdolls is already high. The problem is that when they interact with meshes, such as, rocky stone paths or certain spots in the landscape that appear as grass but are actually giant rock meshes, will still cause ragdolls to slide unrealistically. I cannot confirm these issues. It's mostly caused by conflicting skeleton meshes. Make sure that you let other mods replace the skeleton.nif from this mod, even if it's for a compatibility patch. Higher framerate than 60 will cause issues with physics.